Grated parmesan cheese Directions: 1. Insert the container, meat, eggs, bread crumbs, parmesan cheese, basil and garlic powder, form into balls of medium size. 2. in a saucepan, heat chicken broth until boiling, add spinach leaves, pasta, carrots and meat balls earlier. 3.Didihkan back, turn the heat down. 4.Masak kept in a small fire, until the paste is softened, stirring occasionally so the pasta does not stick to each other. 5 .Angkat and serve in a bowl to add the remaining grated parmesan cheese. 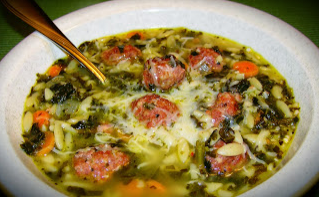 According to legend, Italian wedding Soup is a traditional dish that is usually served during the wedding celebration of the Italians. It was said that this soup is also known as an energy food for the provision of a new partner in the wedding night. In fact, the real meaning is this soup is a wedding or a combination of vegetables and meat in one meal. And the Italians themselves never served this dish at the wedding. It's not hard not to make Italian Wedding Soup? Follow along other foreign soup recipe just in. 0 Komentar Untuk "Cuisine From Italy - Italian Wedding Soup"